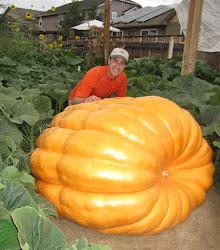 Giant Pumpkin Growing Tips From The Pumpkin Man: 18% Heavy on the Scale! Great End to a Tough Pumpkin Season. 18% Heavy on the Scale! Great End to a Tough Pumpkin Season. Yesterday I took my pumpkin to the Old Colorado City Giant Pumpkin Weigh-off. I've never been to this event before and had heard good things and since my pumpkin was growing slow I figured I would give it as much time as possible to grow, as this is the last weigh-off of the season in Colorado. To my pumpkin's credit it grew long. Was still growing when I picked it and considering I thought I lost the pumpkin 75 days before when I had irrigation problems and it never did over 11 pounds a day after that and it had the biggest Dill Ring I've ever seen, I am amazed by that. My pumpkin was estimating in the low 600s by the measurements, but ended up at 747 pounds. Although that is about half of what I was hoping for this year, it as a lot heavier than I expected. A pumpkin that goes 5-7% heavier than what the charts indicate in my book is very heavy pumpkin, but for this pumpkin to go 18% heavy is crazy. My pumpkins typically, like most Colorado growers, go a little light. A very nice suprise on the scales. It makes me wonder now what this plant could have done if I didn't have all of the problems that I did. When you look at the picuture above it isn't difficult to image how the lines of the pumpkin would be different. This pumpkin grew on a side vine because I lost the main and then it got really jacked up by the water issues. Would love to have another shot with this seed again. I'm considering very strongly growing the seeds from this pumpkin next year. I liked the 282 pollinator and this plant was the best looking plant I've ever had the first part of the season. May give it another shot. Now it is time to start prepping for next year.